It’s hard to believe the Federation of Genealogical Societies (FGS) 2013 Conference is just a little over two months away! I’m really looking forward to spending a week in Forth Wayne, Indiana, where I can visit with all my genealogy friends (and hopefully meet some new ones!! ), explore the exhibit hall, take in some wonderful lectures, and of course, spend some time at the Allen County Public Library. And of course I have added a few days to the trip so I can spend some time at the Allen County Public Library. I’ve never been to ACPL so I’m really looking forward to my first visit. I’m still working on my plan of attack, but fortunately, I had previously added plenty of to-do items to my Legacy database, so a quick filter on ACPL showed a lot of resources I need to check out. I’ve also been perusing the ACPL card catalog and the Genealogy page for guidance. Not sure if I’ll break down any brick walls, but you never know what you’ll find until you look! 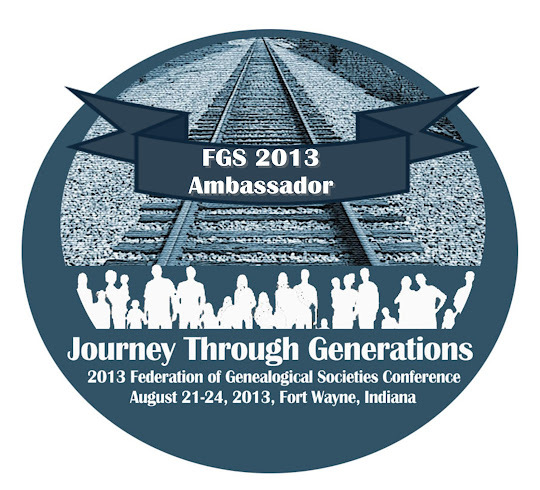 The FGS 2013 Conference is being held August 21-24 in Fort Wayne, Indiana. If you haven’t registered for the conference yet, there is still plenty of time to do so and still get the early-bird rate of $190 (ends July 1, after that, the rate increases to $240). Hope to see you there!! This post was written for the May/June Ambassador Blogging Prompt as part of the FGS 2013 Conference Ambassador Program.